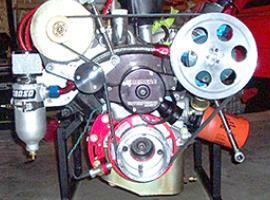 Small Block Chevy, stock water pump: low mount, driver's side. 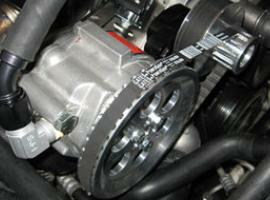 50 amp Nippon Denso remanufactured A100 alternator. 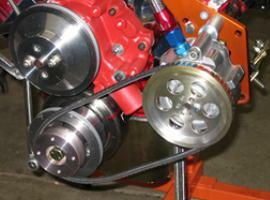 SBC VP101 head mount on drivers side with top brace by owner. 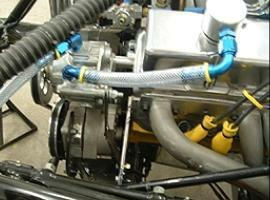 SBC with VP101 Vacuum Pump mounted on drivers side cylinder head with brace bracket installed to the intake manifold. 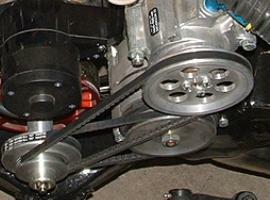 SBC with VP101 mounted on the passenger side head with 8" serpentine pulley (aftermarket reduction crank pulley). 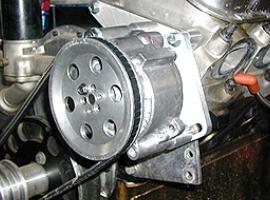 SBC with VP102 Vacuum Pump mounted on the block upper bolt hole in front of motor plate. 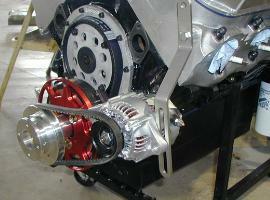 Mini-Alternator mounted in lower block hole. 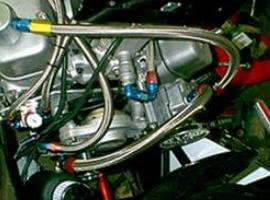 Customer fabricated custom brackets on this installation. 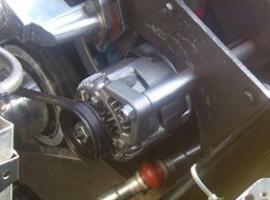 VP104 Super Pro Vacuum Pump, Drivers Side Head Mount. 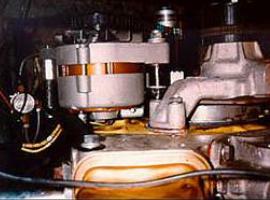 VP104 Vacuum Pump mounted on the passenger side motor plate, the A106 Denso Alternator on the Drivers side motor plate with the low alternator mount. 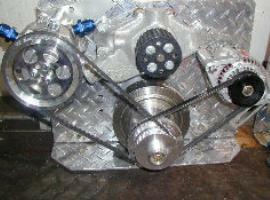 For the drive system, this example uses the 3 Bolt Crank Mandrel using a Gilmer belt to the pump, and a V belt to the alternator. 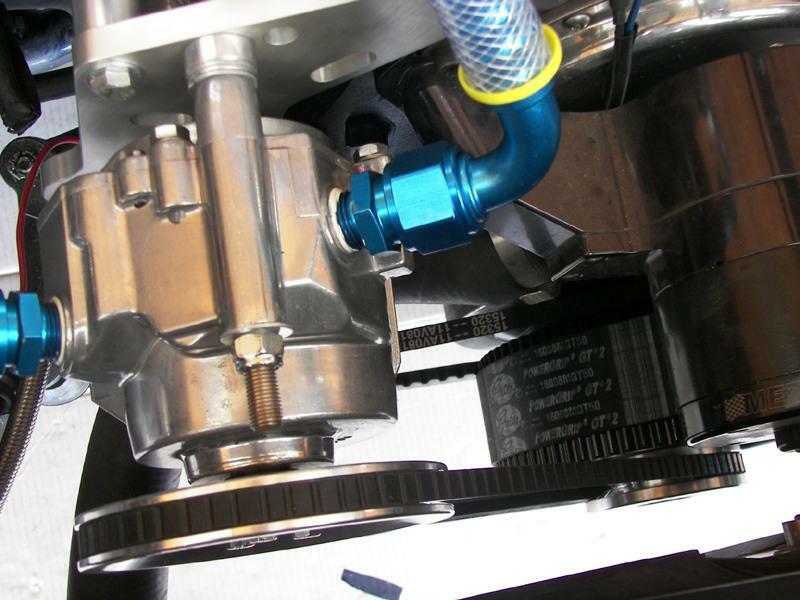 Small Block Chevy drivers side VP101A	pump using the UVPM mounting plate bolted to an open hole in the front of the Intake manifold and to a head hole. 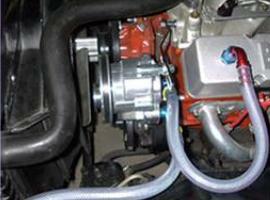 Clyde Carlson invented this change to the standard install using the UVPM Bracket. 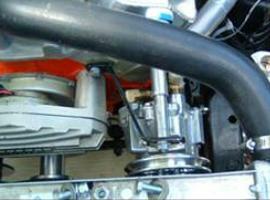 Also on the same installation we can see the Lock On Breather in the drivers side valve cover. 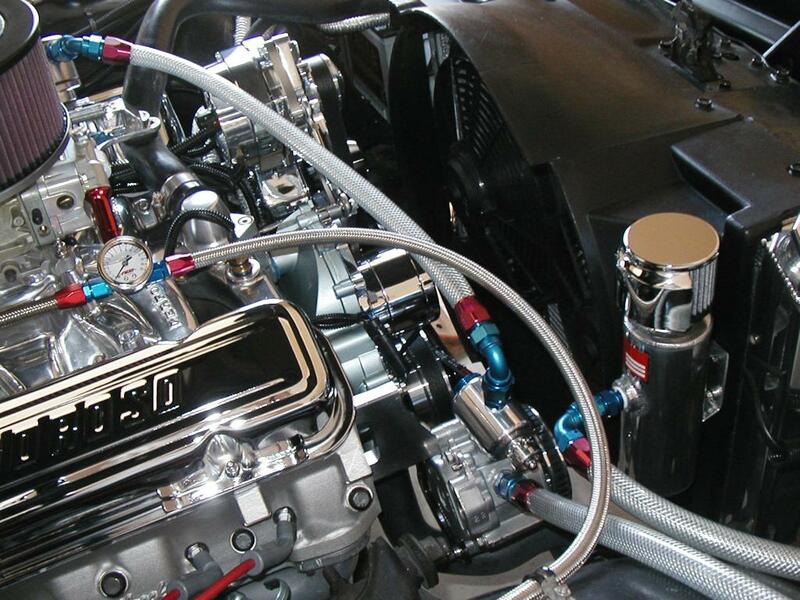 VP104 Super Pro Pump installed in a LS Nitrous Injected 99' Camaro. 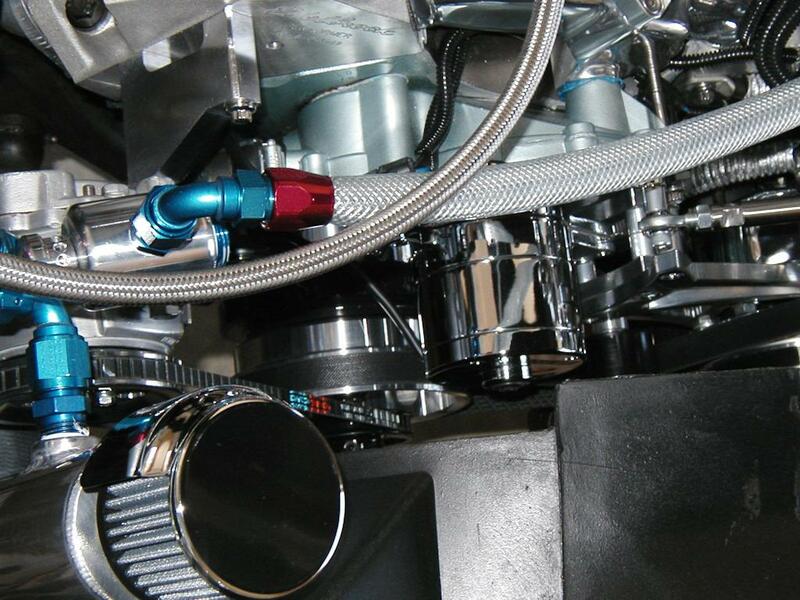 Gilmer Belt drive uses GZ TP100 Gilmer/Serpentine Idler Pulley with stock tensioner and VCV101A Vacuum Relief Valve installed in Vacuum Pump. 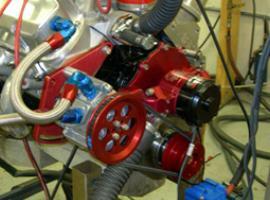 VP104 Super Pro Pump on Late Model Vette. 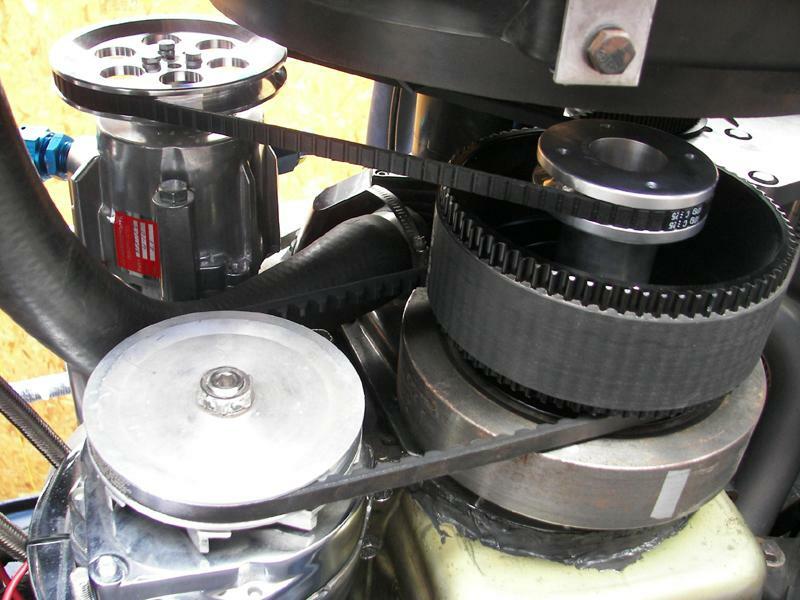 Gilmer Belt drive uses GZ TP100 Gilmer/Serpentine Idler Pulley with stock tensioner and Vacuum Relief Valve / Fill Cap Assembly. 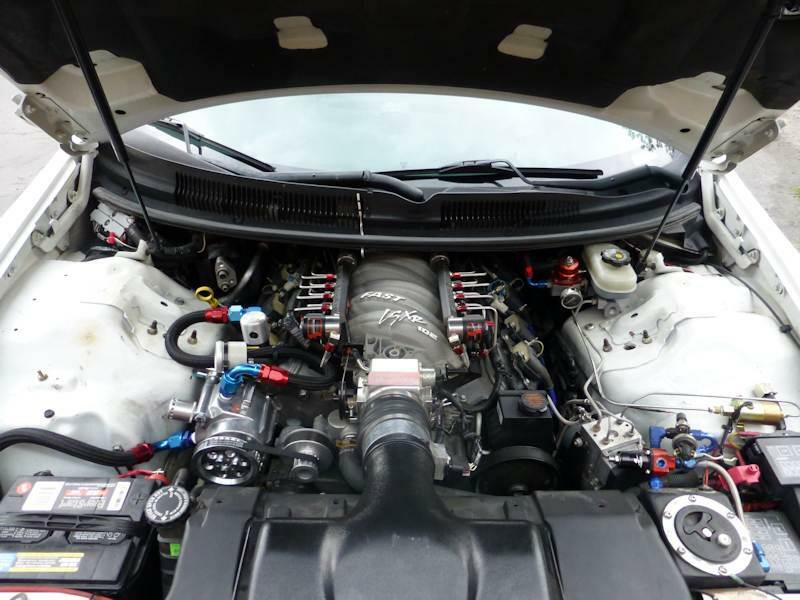 2008 Z06 Corvette w/LS7 Engine sporting the Sportsman LSX VP102 Vacuum Pump Kit on it. 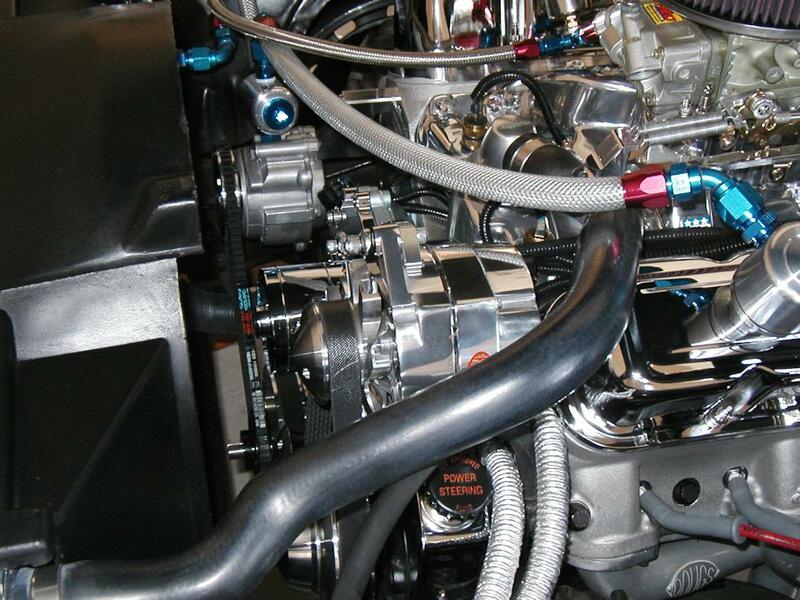 2008 Z06 Corvette w/LS7 Engine close up view of the Sportsman LSX VP102 Vacuum Pump Kit..
LSX F Body with a Sportsman LSX VP102 Vacuum Pump Kit on it (Right Side View). 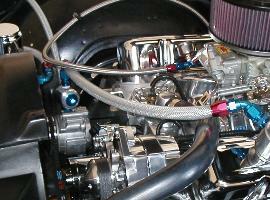 LSX F Body with a Sportsman LSX VP102 Vacuum Pump Kit on it (Top View). 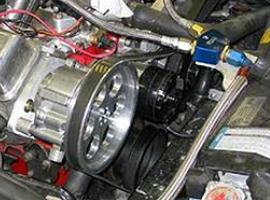 LS1 Chevy Corvette with VP102 Vacuum Pump, replacement billet tensioner pulley, Gilmer Drive Belt Pump and Mandrell Pulleys. 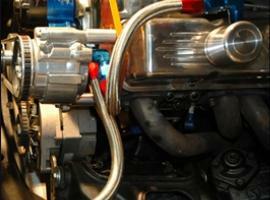 See the GZ LSX Vacuum Pump Kit for a complete Kit for your Corvette. 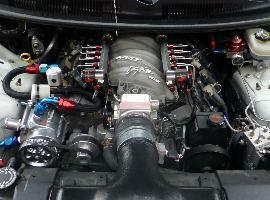 LSX Chevy Corvette with VP102 Vacuum Pump. 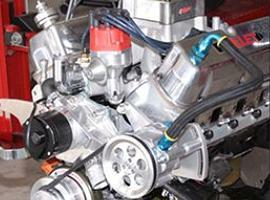 See the GZ LSX Vacuum Pump Kit for a complete Kit for	your Corvette. 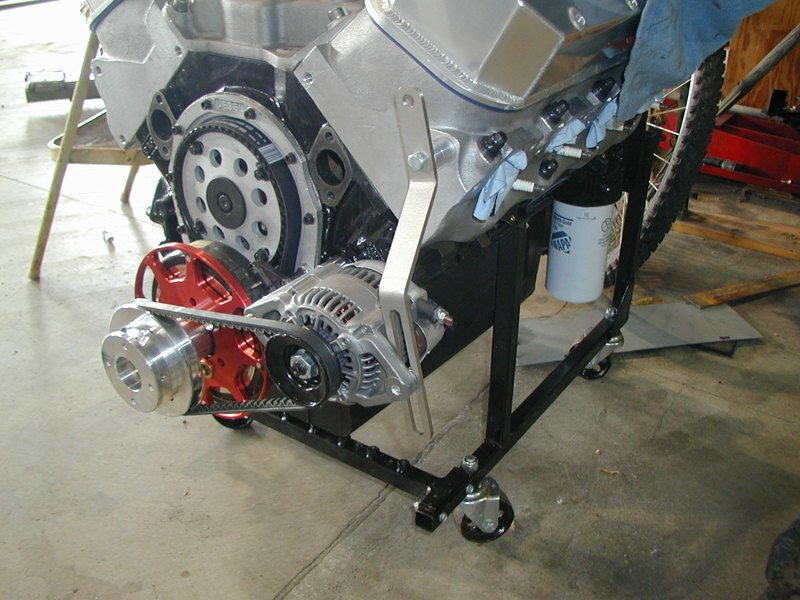 Tall Deck Big Block Chevy, CSR Water Pump with VP104 Vacuum Pump: Passenger side Head Mount using UVPM Mount on AFR Heads. 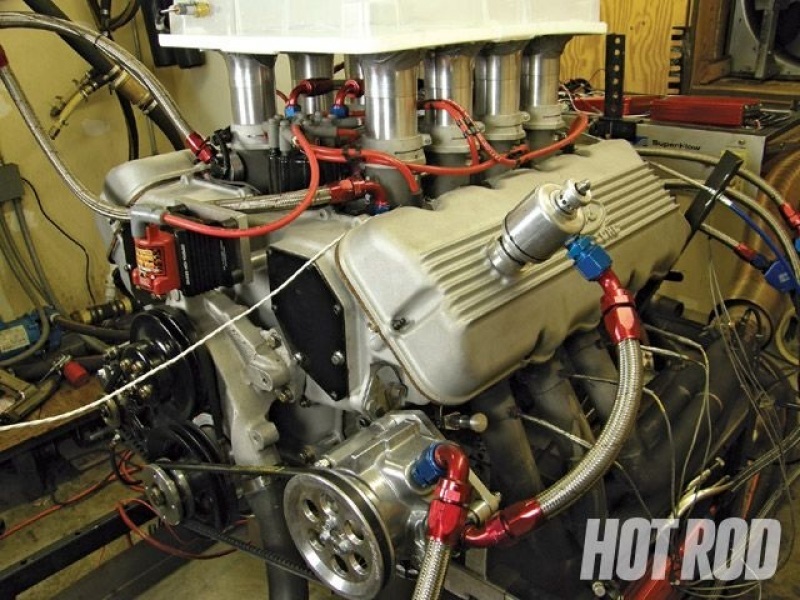 Alky Injected Big Block Chevy with VP104 Vacuum Pump. 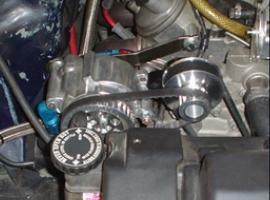 Drivers side Head Mount using UVPM Mount & VPPG Series Gilmer Belt & Pulleys. 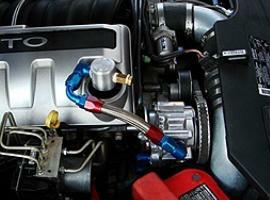 BBC with VP104 Pro vacuum pump and UVPM mounting bracket on passenger side. 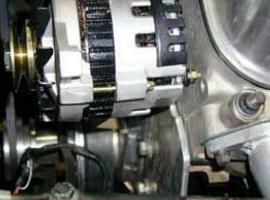 A101 Denso Super Mini Alternator using water pump mount Driver side. 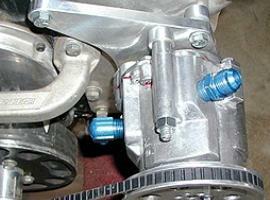 Big Block Chevy, VP104 Pro Vacuum Pump utilizing SB101 mounting stud bolt and spacer, driver's side head mount. 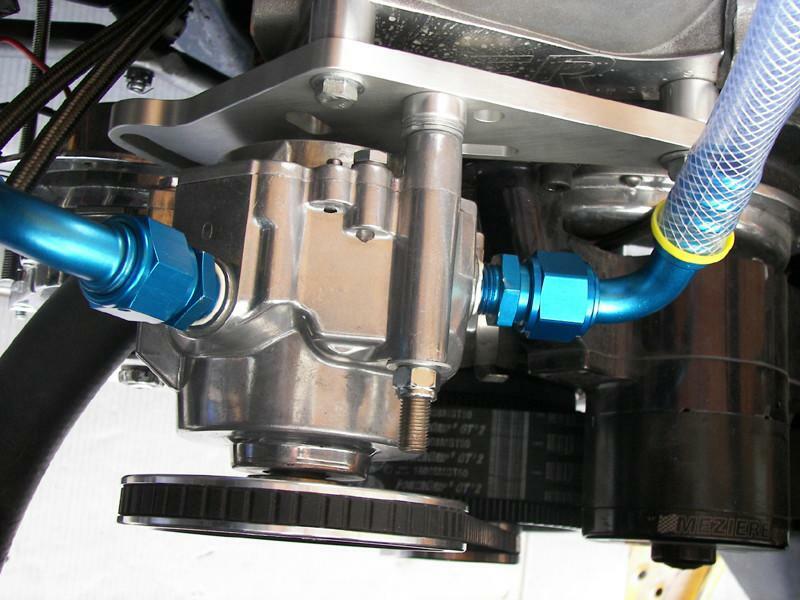 VP102 Sportsman Vacuum Pump using Water Pump Mount, Passenger Side Head, High Location. 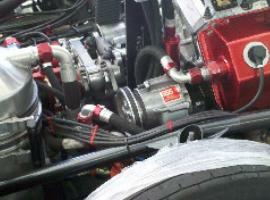 Alternator mounted in low location, Drivers Side on a Big Block Chevy with Dedenbear pump. 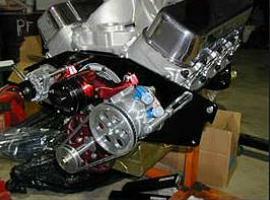 Big Block Chevy, Dedenbear Water Pump with VP102 Sportsman Vacuum Pump: water pump high installation, driver's side. 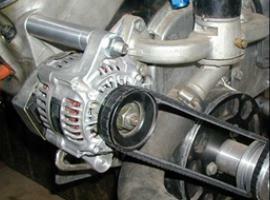 Alternator: water pump high installation, passenger's side. 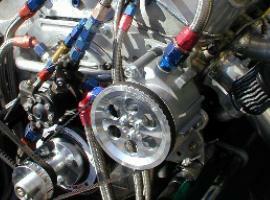 Big Block Chevy, Weiand Water Pump, Nippon Denso Alternator, Driver's	Side, water pump low Mount. 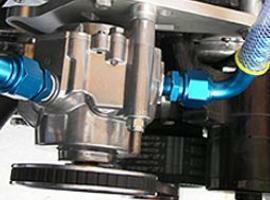 Vacuum pump, passenger's side, water pump high mount. 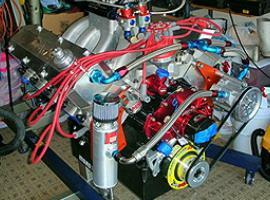 Big Block Chevy, VP104 Pro Vacuum Pump, Dedenbear Water Pump. 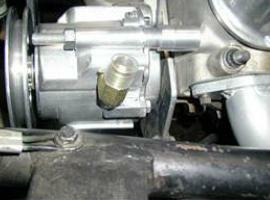 Water Pump High Mount, Driver side. 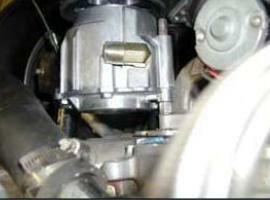 BBC 55 amp Denso super Mini A101 with a head mount installation (motor plate installation similar). 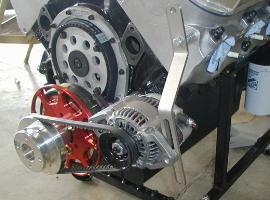 A101 Racing Alternator on Big Block Chevy - Low Mount. 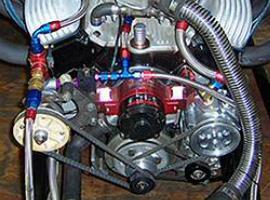 Big Block Chevy, Shogun Water Manifold, Nippon Denso A100 Alternator, water pump low mount. 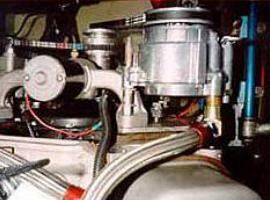 Big Block Chevy, Shogun Water Manifold with VP101 Vacuum Pump: water pump low mount, passenger's side; Nippon Denso 50-Amp Alternator: water pump low mount, driver's side. 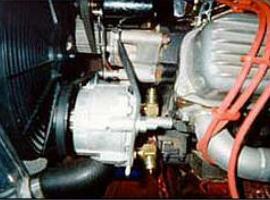 Big Block Chevy, A104 Mini AC Delco alternator, high water pump mount, driver side. 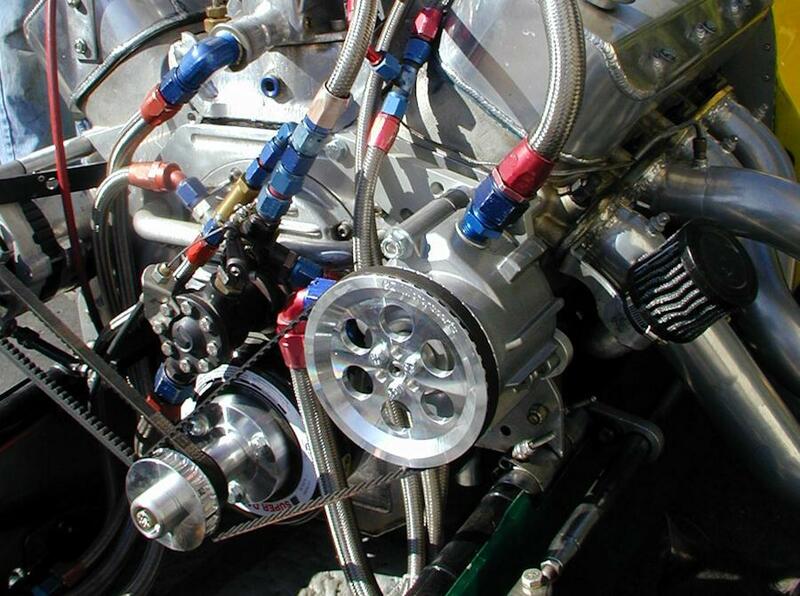 Big Block Chevy, Mezziere Water Pump, low water pump mount, VP104 Vacuum Pump Kit and GZMS Denso Super Mini Alternator Kit High Water Pump mount with GZMS mandrel and mandrel pulley. 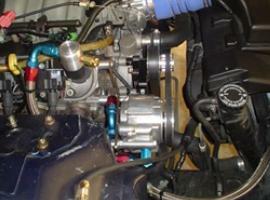 BBC with VP104 Vacuum Pump mounted on the drivers side inner head bolt hole. 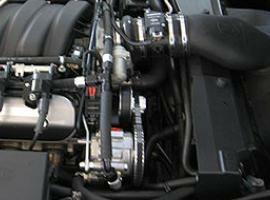 BBC Motor Plate installation using the UVPM Mounting Bracket with a VP104 Vacuum Pump. 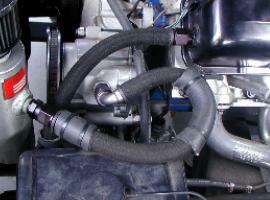 Pump is mounted on the drivers side. 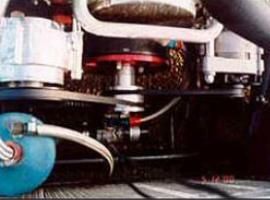 BBC VP104 Vacuum Pump using UVPM Mount on Drivers Head with Motor Plate. 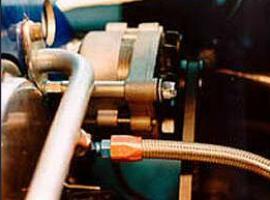 Big Block Chevy VP104 Vacuum Pump using UVPM Mount on Drivers Head with Motor Plate. 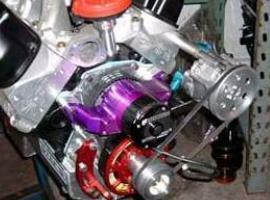 BBC with A101 Super Mini Denso Alternator mounted to passenger side head. 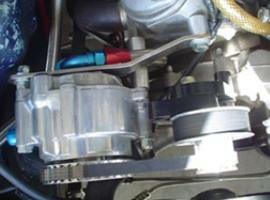 BBC Motor Plate installation using the UVPM Mounting Bracket with a VP104 Vacuum Pump. 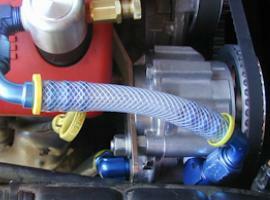 Pump is mounted on the passenger side head. 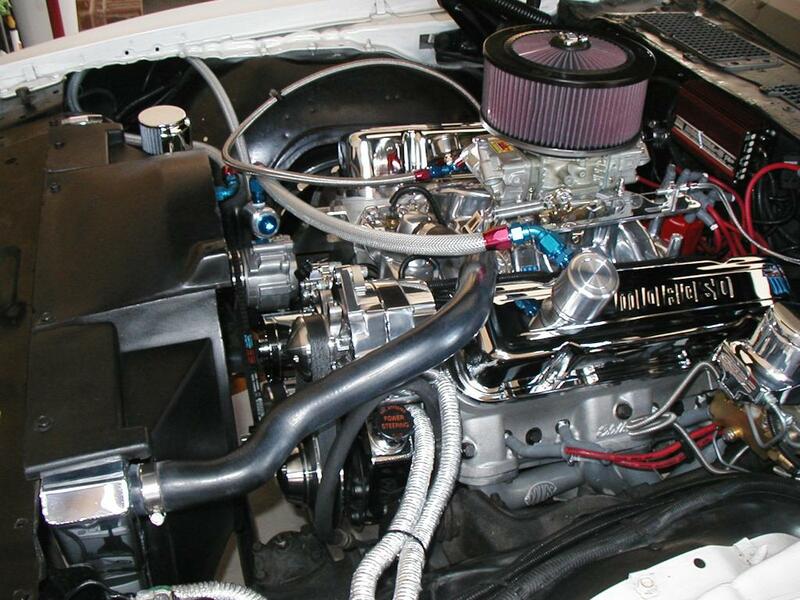 347 Small Block Ford with VP101 Sportsman Vacuum pump and kit. 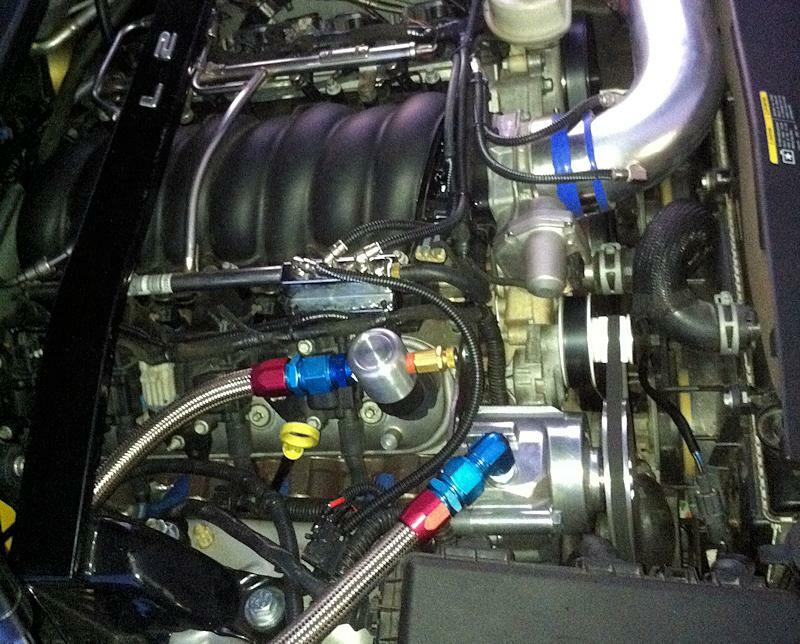 FE Ford with VP104N Super Pro Vacuum pump, Brace Bracket Mounting Kit and BT3 Baffled Breather Tank. 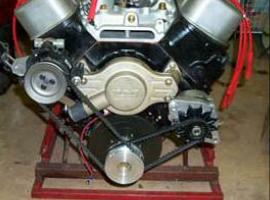 302 Small Block Ford using the UVPM mounting plate, CP103A Mandrel and a March Crankshaft Pulley. 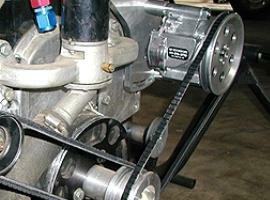 This installation uses 3 three mounting holes instead of the two provided by adding an offset spacer to the right. 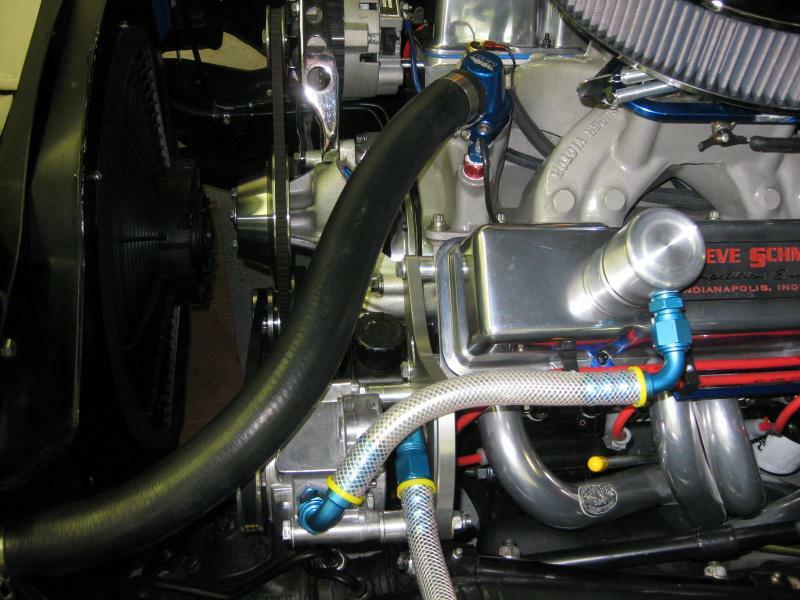 Vacuum Pump used is our VP102 Pump Kit with Street Options in a Cobra Road Race Car. 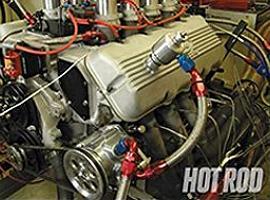 Hot Rod Magazine Cammer Build up on a Ford 427 SHOC using the VP104 Vacuum Pump and customer	supplied brackets. 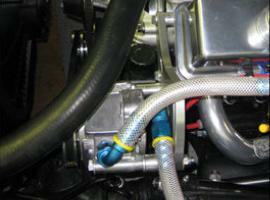 Also shown is our lock-on breather with relief valve installed in it. 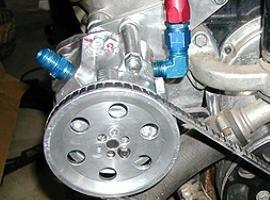 This design reduces the amount of air drawn through the motor when the relief valve opens. 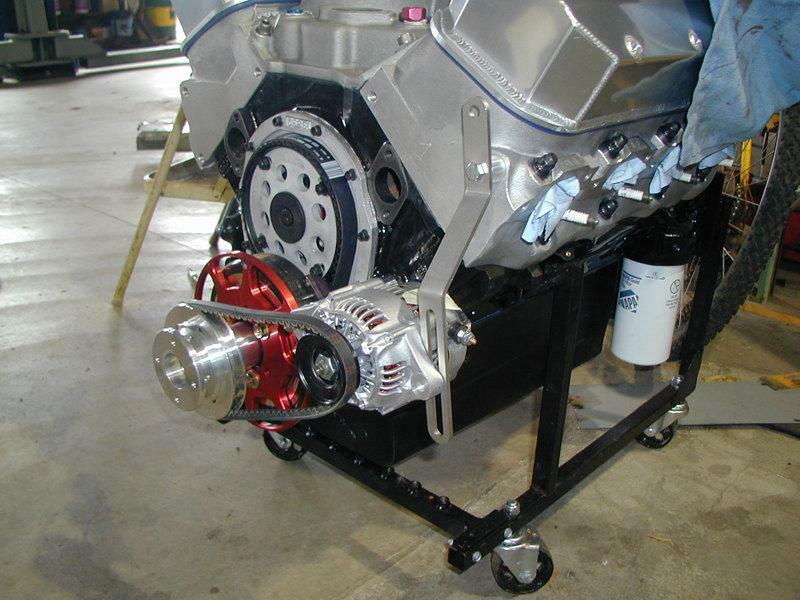 Super Pro VP104 Vacuum Pump mounted on a Big Block Ford using our UVPM Mount, CP103A SBF Pulley and the GZMS lock-on breather with relief valve. 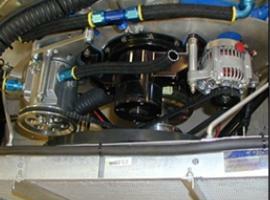 Big Block Ford Vacuum Pump kit with VP104 Pro pump and UVPM mounting - Drivers Side. 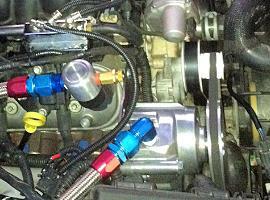 Also used a UVPM Mount used on the Passenger Side to mount BT3 breather tank. 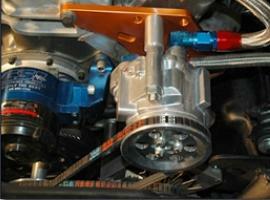 Big Block Ford Vacuum Pump kit with VP104 Pro pump and UVPM mounting plate - Passenger Side. 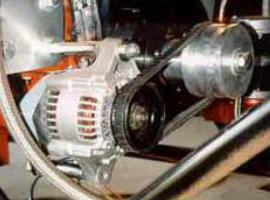 A101 Alternator on a BBF motor plate (motor plate on the timing cover) in a Ford Pinto. 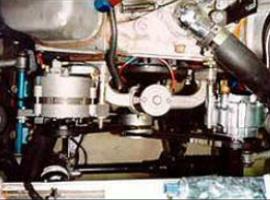 This install required a custom brace bracket by the owner due to the proximity of the steering column and limited size of the motor plate. 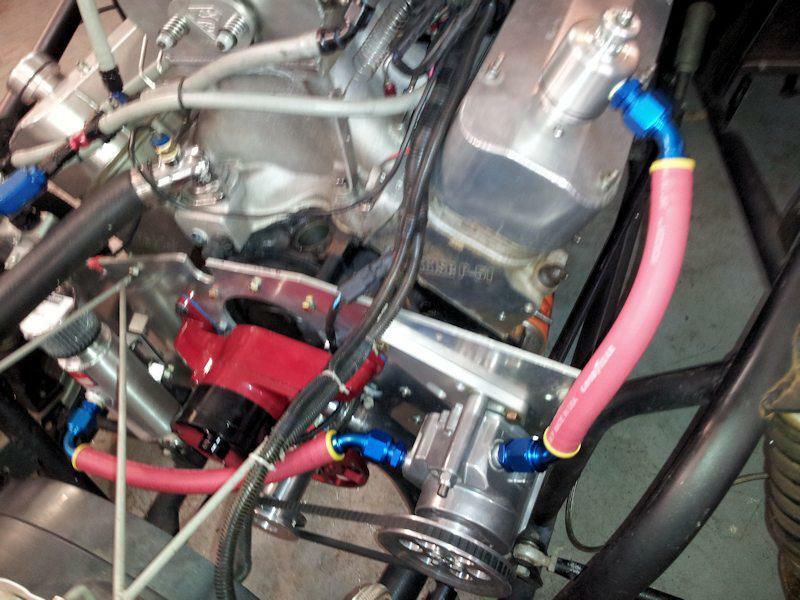 Don Obrien's beautiful Pontiac with the GZ VP102 Vacuum Pump, Vacuum Control Valve installed in pump inlet. 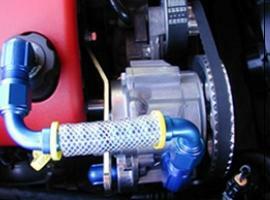 The Pump is mounted low on the passenger side with customer mounts. 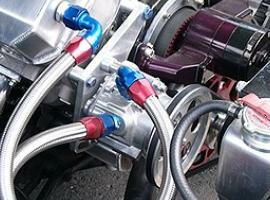 Also used on this install is the VCB100 Lock On Breather and the VCB101 Aluminum Lock On Oil Fill Cap. 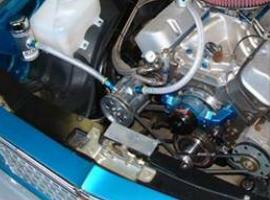 Small Block Mopar with VP101 Vacuum Pump mounted on the passenger side head. 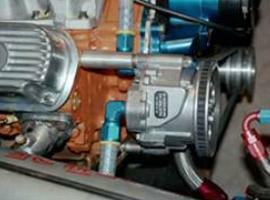 Big Block Mopar, VP101 Vacuum Pump: head mount, driver's side. 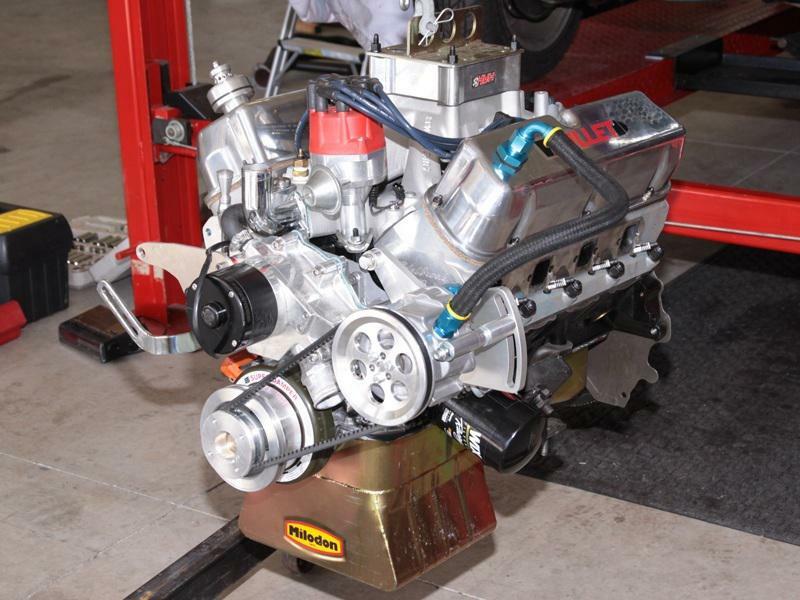 BAE Pro Mod Hemi / Big Block Mopar, VP104 Super Pro Vacuum Pump:using UVPM mounting plate head mount, driver's side as shown on Mike Janis's Pro Mod Mustang.